You are here: Home » Passion in Our Kids … fruit or goal of homeschooling? 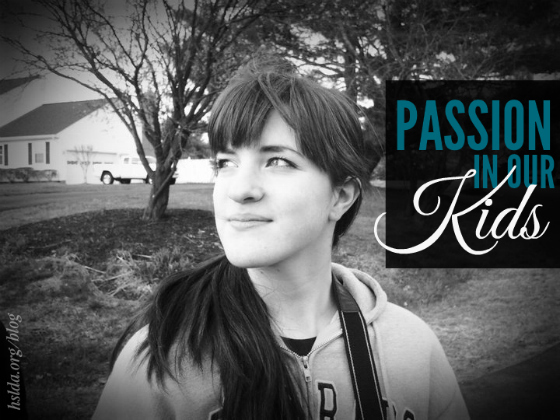 Passion in Our Kids … fruit or goal of homeschooling? A couple years ago, I shared a post about one of my children, John, who sort of fell into a short acting career during our homeschooling journey. John was only 11 when this adventure started. He was just going into junior high, and though clearly undecided on what he wanted to do for the rest of his life, he was pretty passionate about wanting to act in this season of his life. I shared about his first couple year’s experience in this post, with a promise of an update. Well, it’s been over two years and I’ve yet to share the rest of his acting story, which I’m now committed to do very soon. In the meantime, an article I read the other day in the NY Times, entitled, “Our Push for ‘Passion,’ and Why It Harms Kids,” got me thinking about the idea of passion in our children. The title alone piqued my interest. Passion? Is this author saying it’s wrong for our kids to have passion? Lisa Heffernan starts her article making an interesting case for how popular the notion of passion is today. Parents, educators, and even college admissions officers seem to put a premium on kids having ‘passion.’ Being well-rounded is clearly out-of-style, at least to that last group. If passion were just a matter of semantics, a word heedlessly thrown around in place of interest or pastime, this might not be a problem. But seeking a passion in childhood or adolescence has become an obsession in itself, and it is not without costs. Courage, mom…I dared myself to read on. Lisa then talked about how passion pushing parents run out and buy the latest gadget, tool, or equipment every time their kid shows a little interest in something. “Hmm…I could definitely say that about my curriculum purchases…all the school books I bought, fully intending to use, but never getting around to planning it into our homeschooling year…sigh. I’d like to think of it [buying all the stuff] as evidence that we let our children try new things; instead, I think it’s proof that we ran to the music, art, book, or sporting goods stores at every opportunity, lest a passing interest fail to bloom into a passion because it lacked parental money or dedication. The activity/hobby had to be close to home—as in a 15-minute drive or less. Raising and homeschooling seven children in 10 years would have meant misery for all of us, if we had spent a huge amount of time in the car, going to this lesson, that game, or that class for each child. That was not the kind of homeschooling lifestyle I wanted to live! Of course, we made exceptions for special, one-time opportunities for our children, such as Wycliffe’s translation and linguistic camp when Bethany when 14 or John filming on location in MI for Josh McDowell’s Undaunted when he was 13, but regular activities had to be near home. My children had to exhibit more than a fleeting interest in something for us to make a commitment to it—when Upwards Basketball came to the Baptist church five minutes around the corner, we checked it out. It was an instant hit with several of my children. Sure, they were interested in playing basketball with other kids, but almost even more, they were excited about the Scripture memory challenges and devotion time each week. All around, this activity was a hit—spiritual growth, exercise, teamwork, friendship, and healthy competition…all five minutes from home! It had to fit within our family finances—we had a budget and we stuck to it. I knew God could provide for the cost of an art or piano lesson, Upward basketball, or any other activity my kids were really interested in. So, if we didn’t have the money for it, we prayed and asked God to provide if it was something He wanted us to do. One year, I did some admin work for my kids’ art teacher to pay for their lessons. Another year, the kids and I had a huge yard sale to raise the funds for activities. He even provided for us through financial gifts from immediate family to apply to lesson fees. When God didn’t provide the resources, we trusted that the lesson or activity wasn’t necessary for our children’s development. Regardless of what we did with our kids, God’s glory and the spiritual good of our kids needed to be the primary goal—besides teaching them a practical skill, we asked God to use the activity to draw our children closer to Himself, develop godly character in them through it, and bring glory to His name through their participation in it. A tall order, I know, but Chris and I believed that God is always actively at work in us and in our children through our life experiences. He can use anything and has used many things to help us know Him better, and to shine His goodness and greatness. The author of the article ended by placing an emphasis on exploration over passion in our kids. Perfect for homeschoolers, isn’t it, because we can provide lots opportunities for this in homeschooling. And often, that exploration leads to a God-given, natural passion which we can foster while holding it loosely, letting God move our children on to other things down their educational road. With Him leading us and giving us wisdom, nothing our kids learn and do need be a waste of time, energy, or resources. In this light, passion becomes the fruit of, rather than the goal of home education. Photo Credit: Taken and edited by Megan Klicka Wilson, graphic design by Charity Klicka.